In an effort to revitalize the CU Boulder AIAS chapter in recent years, our board has been hard at work to provide the best experience to our members. We have put in countless hours on the side bringing in practicing architects, touring buildings & firms, and ensuring there is always enough pizza for everyone at our meetings. To boost membership, we decided to think out of the box. Thus, the glow stick building competition was born. Lasers and rave music set the scene for the big event. Our competition featured 4 teams going at it head to head. The rules were simple. The teams were given a 45-minute build period. Each team was given more than enough glow sticks to satisfy their creativity. At the end of the 45-minute build period, the judges would decide the winner. Fifteen minutes into the competition, we introduced our “game-changer.” The teams were given unique glow stick connectors. Rather than your run-of- the-mill straight connectors, these connectors had the capacity to create 8 connections. Perhaps the biggest challenge we faced was defining our event. While we had beautiful flyers up, students didn’t seem to understand what a “Glow Stick Building Competition” would completely entail. This test run set the stage and gave us a more solid understanding of what we can do. It was our members who did all the work to flesh out this idea. 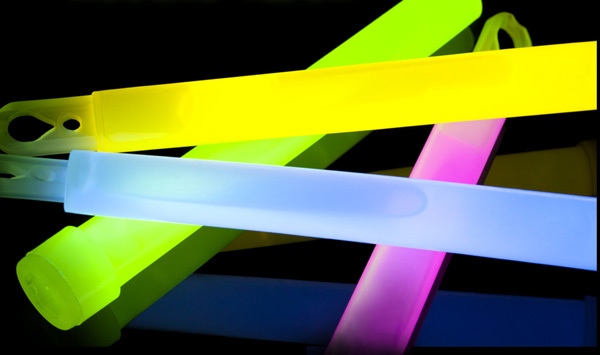 Using glow sticks as a medium hadn’t ever been considered by most our members. It presented a new challenge for us to think critically and analytically. Yet regardless of the barriers that presented themselves, the competition was fierce. When you get four teams of architecture students, you can be sure that the results will be worthwhile. The members at the event put on a spectacular show. Watching everyone build and improvise during the competition was a sight to behold. More than once, the direction of a project changed, and the team was forced to adapt. At the end of the night, we crowned the victor, Dan Liu. Putting on this event laid the foundation for the next glow stick building competition. For the next event, we’re hoping to at least double our attendance. As our board gains more experience and we gain more and more members, the glow stick competition will continue to grow and be improved upon. Our board members also took the opportunity to take photography in the dark of the event and all the contest entries. We were able to really capture some amazing moments. For all the photos, click here. This event couldn’t have been put on without the support of all our members, including the board who helped organize this event. We are anxious to host another glow stick building competition in the fall!